Pasta with beans may sound funny, but it is a traditional combination in Italy. Once you try it, you will understand why. For this light, quick supper I added a few pieces of sauteed sausages, tomato sauce and a garnish of freshly grated Parmesan cheese. Boil water and cook some bow tie (or other favorite) pasta. This dish works best with small shapes of pasta rather than noodle styles. In a medium size sauce pan, add a drizzle of olive oil and saute sliced pieces of sausage. I used a spicy turkey sausage. When the sausages are browned, remove them from the pan and set them aside. Add chopped onions to the pan and cook them until translucent. Add a couple of minced garlic cloves and cook until they are fragrant. Now add a can of drained and rinsed kidney beans. Add a small can of chopped tomatoes and half a can or so of tomato sauce. Add a splash of red wine to get the consistency you like. Add salt and black ground pepper to taste, and a little red pepper flakes if you like a kick of spiciness. (I do). Return the sausages to the pan and heat it all through. When the pasta is done, drain it and place a serving on a plate. Cover it with the bean and sausage sauce, then garnish liberally with fresh Parmesan cheese. Enjoy with a hearty red wine. This is one of my favorite meals. Here is the first of my dishes made from the gift of lemons we received:(see previous post). 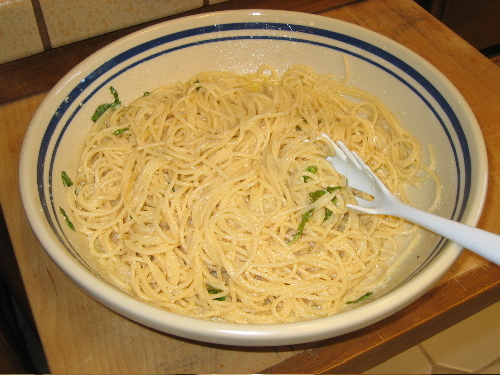 Lemon Spaghetti, an outstandingly delicious and simple recipe from Giada De Laurentiis' new cook book "Everyday Italian". Warm drained pasta is dressed with olive oil, freshly grated Parmesan cheese, basil, and freshly squeezed lemon juice. Season with salt, pepper and the lemon zest and be prepared to watch the stunned faces of the diners who might have underestimated this dish. We served it as a side to a sauteeed chicken, and it was perfection. This recipe has already made an encore and is in the permanent file, as a refreshing and lively change for a summery evening. To make the lemon pasta dressing, mix two thirds' cu of olive oil with the same amount of grated Parmesan and half a cup of lemon juice. Salt and pepper to taste, add a spoon of lemon zest and chopped basil to round it out. The sauce can be made up to eight hours ahead of time. Reserve a little of the pasta water to loosen the sauce if desired.